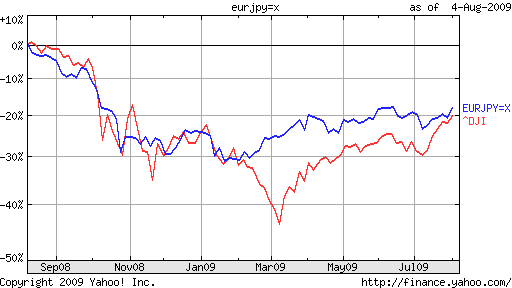 Yen Carry Trade is Back, but for How Long? A pickup in risk appetite over the last few months, however, has brought about a decline in volatility. “Implied volatility on seven major currencies has fallen to 13.8 percent from a peak of 26.6 percent in October…from an average of 15.4 percent over the past year.” As a result, Japanese investors have rushed back into the market. The total number of forex margin accounts in Japan is estimated to have increased 50% over the last year, with account balances rising by 30%. 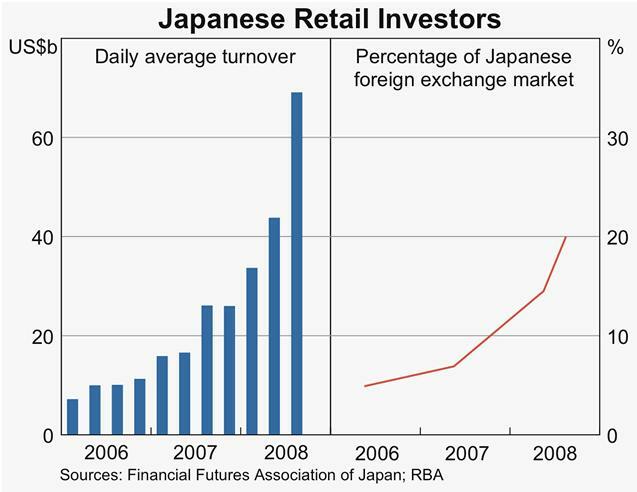 In 2008, Japanese retail investors already accounted for 20% of daily turnover in the Japanese Spot Forex market. When you consider these growth rates, this figure is probably even higher now. There is evidence, however, that such investors are shifting their trading strategy. Prior to the credit crisis, the data shows that they “Increased their foreign currency net long positions when the investment currency depreciated and reduced these positions when the investment currency appreciated. This behaviour is consistent with realising returns by selling positions when the investment currency appreciates and adding to positions when the investing currency depreciates.” Now, however, they have taken to copying “professional” speculators, who tend to swing trade short-term changes in momentum. As for which currencies represent the most popular targets for carry trades, investors typically buy those currencies that are less volatile and higher-yielding. “The favorite bet is for the Australian dollar to strengthen versus the yen. Wagers on the Aussie more than tripled to 64,293 contracts in the five weeks to April 27, while those on the kiwi — named after a flightless bird native to New Zealand and depicted on the one dollar coin — rose to 36,454.” The Euro is in a distant third. Perhaps in response to this pickup in carry trade activity, the Bank of Japan is finally clamping down. Rather than raise interest rates – which could harm the prospects for economic recovery – it will require Japanese brokerages to lower margin rates by 2010, to 25 x collateral. Still, logic (and legislation) doesn’t rule, when it comes to forex. ” According to a Federal Reserve Bank paper, “The currencies of countries with low interest rates have tended to depreciate, or to not appreciate sufficiently to offset arbitrage opportunities.” For now at least, it likes like the carry trade is still safe.